Lumbar disc herniation is very uncommon in children under the age of 10 years. We report on a lumbar disc herniation in a 9 year old. The patient presented with spontaneous onset of back pain and right leg pain which had failed to respond to 6 months of conservative treatment at a primary health care facility. Examination revealed severe lumbar back muscle spasm, listing of the spine to the left and a positive straight leg raising test on the right. The child had weakness of the right big toe extension. 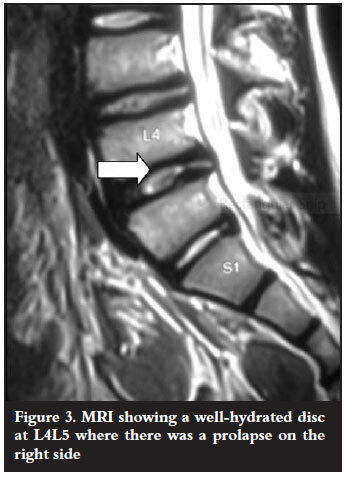 Magnetic resonance imaging (MRI) confirmed a disc prolapsed at L4L5 compressing the traversing right nerve root of L5. A standard discectomy followed by rehabilitation was performed after a further 2 weeks of observation. The muscle spasm and listing together with the right big toe motor weakness disappeared post operation. At 3 months follow-up he was back into his school activities. 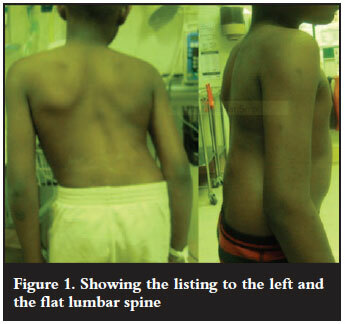 A 9-year-old boy presented to the Spinal Unit Department with a 6-month history of unremitting lower backache radiating down the right leg. The pain was of spontaneous onset with no history of trauma. The child had been treated with physiotherapy, non-steroidal anti-inflammatory medication and rest since its onset without success. There was no reported bowel or bladder dysfunction. 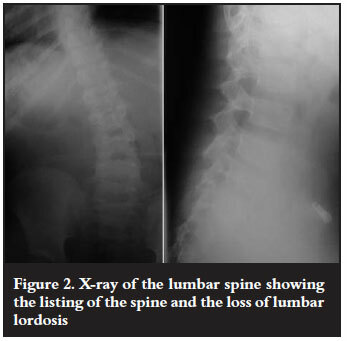 On examination he had loss of lumbar lordosis and was listing to the left (Figure 1). He was tender on palpation of the lumbar spine. He had an Oxford grade 3 weakness of the right big toe extension. The straight leg raising test was positive on the right side. Plain radiography showed the listing to the left (Figure 2). An MRI scan revealed well hydrated discs, and a disc protrusion at the L4/5 level (Figure 3). Blood investigation revealed a normal erythrocyte sedimentation rate (ESR) and C-reactive protein (CRP). 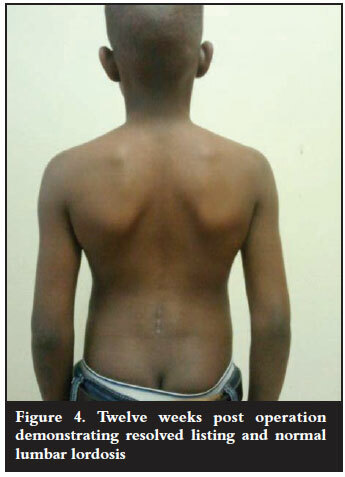 After a further two weeks of conservative treatment with non-steroidal anti-inflammatory drugs and physiotherapy the child's posture did not improve and he remained in severe pain. The patient was taken for a standard discectomy at L4L5 using a 3x magnification loop. The inflamed right L5 nerve root was found attenuated over the prolapsed disc and bulging annulus fibrosis. After sharp dissection of the bulging annulus, the prolapsed disc was removed in one piece with a pituitary rongeur. There was no cartilage in the removed herniated disc material. The rest of the disc was not removed. The right L5 nerve root could be mobilised with ease after the discectomy and the decompression was felt to be adequate. No fusion was done. Post-operatively the patient rehabilitated very well. His posture and the leg and back pains resolved post operation and he was discharged to home on the fifth day. The motor power to the right big toe had fully recovered at 12 weeks post operation. The listing and the flat lumbar back had resolved at 12 weeks' follow-up (Figure 4). Lumbar disc herniation is a rare disorder in children. In 1945 Wahren reported on a lumbar disc herniation in a 12-year-old child.1 In a report published in 1982 of the 9 991 discectomies done at the Mayo clinic only 0.5 % were children of the age 16 years and younger.2 In another report from Japan out of 456 patients who had undergone a discectomy 70 (15.4%) were 19 years and younger.3 From this report it appeared that the incidence of juvenile disc herniation is higher in Japanese patients than in Caucasians. Zitting et al carried out an epidemiological study to find the true prevalence by following 12 058 babies for 28 years.4 None of the babies followed up presented with suspected disc herniation in the first 15 years of life. However by 20 years of age there was an incidence of 0.1-0.2%. This increased to 4.2% female and 9.5% male by 28 years of age. Trauma in the form of sports and the lifting of heavy objects has been reported to precede symptoms of lumbar disc herniation in 30-60% of children.3,5,6 Some studies have demonstrated the association of epiphyseal ring separation with lumbar disc herniation in children.7,8 A few reports suggest that trauma was a triggering event on pre-existing disc degeneration in these children.7,9 This is in contrast with the adult population where the disc degeneration commonly precedes the onset of symptomatic disc herniation. A genetic cause is also suspected with 13-57% of affected adolescents being reported as having a firstdegree relative with the same disorder.10 Lumbar disc herniation in children has been associated with transitional vertebrae, scoliosis and other vertebrae anomalies although these influences have not been quantified. More than 90% of children with lumbar disc herniation present with back pain and leg pain. On examination the majority of them will have loss of lumbar lordosis and listing with associated severe restriction of lumbar movement as was the case in our patient. The straight leg raising test is positive in 90% of the children.3,11,12 Unlike our patient, the majority of the children have been reported to have normal muscle power and no numbness.4,13 It is important to exclude infection, osteoid osteoma and traumatic spondylolysis in these patients. Blood for acute inflammatory markers ESR and CRP should be done. MRI is the investigation of choice in confirming the diagnosis of lumbar disc prolapse in children as is the case with adults. Care must be taken to assess and look for apophyseal separation which can be the herniated cartilage material instead of the actual disc material in children. The disc is usually well hydrated as it was in this case. The indication for surgical treatment in children and adolescents with lumbar disc herniation is the same as in adults, namely: cauda equina syndrome, progressive neurological deficit and disabling pain affecting the child's daily activity and refractory to 6 weeks of conservative treatment. While surgery is not the first line of treatment in children as it is in adults, it should not be delayed as the children have been reported to have good outcome even on long-term follow up.3,7,12 Just as in adults the immediate post-operative outcome is very good, but early good outcomes may deteriorate slightly over time. Poor outcomes have been associated with surgery performed very late following the onset of refractory symptoms. Open discectomy is the procedure performed most often in children as is the case with adults. Only the ruptured annulus and the prolapsed disc should be removed. A total removal of the disc is not advocated as that has been shown to lead to stenosis changes at the operated level and degenerative changes at the adjacent.14 Another reason for not taking away the whole disc is that Ishihara et al in their study showed that leaving the inner annulus intact could lead to the regeneration of the disc.15 Fusion should not be performed routinely in children. Just as in adults it should be preserved for children where there is a clear indication of instability like congenital incompetent facet joints or severe spondylolisthesis. The complication of standard discectomy is postoperation haematoma collection which is why it is important to use magnification and control the bleeders in these children. There is a 5-10% risk of recurrent disc herniation at the operated level. This tends to respond just as well to a repeat standard discectomy. Lumbar disc herniation is rare in children and adolescents. It is even less common in children under the age of 10 years. The majority of them have an associated trauma cause. While conservative treatment is the first line of treatment discectomy should not be over delayed for these patients as it has better results in patients with refractory symptoms than conservative treatment. No direct or indirect benefits have been received by any of the authors for this publication.